AML | What Does AML Mean? 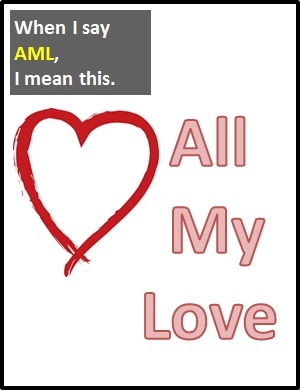 AML means "All my love". It is typically used to sign off a message or is written in a card or letter to someone we care about (e.g., a family member, relative or a close friend). It is usually written rather than spoken. All my love is often written to say goodbye to someone we love. AML is an initialism abbreviation. Technically, this means it is pronounced using its individual letters (i.e., Ay Em El), but as this is harder to say than "All My Love", it is not often uttered using its letters. In other words, the abbreviation AML is for efficiency in writing and not efficiency in speech. Before the digital era, we might have said something like "Lots of love" or "Hugs and kisses" instead of AML.